How does the historian approach primary sources? How do interpretations differ? How can they be used to write history? Reading Primary Sources goes a long way to providing answers for these questions. In the first part of this unique volume, the chapters give an overview of both traditional and new methodological approaches to the use of sources, analyzing the way that these have changed over time. The second part gives an overview of twelve different types of written sources, including letters, opinion polls, surveillance reports, diaries, novels, newspapers, and dreams, taking into account the huge expansion in the range of written primary sources used by historians over the last thirty years. This book is an up-to-date introduction into the historical context of these different genres, the ways they should be read, the possible insights and results these sources offer and the pitfalls of their interpretation. All of the chapters push the reader beyond a conventional understanding of source texts as mere "reflections" of a given reality, instead fostering an understanding of how each of the various genres has to be seen as a medium in its own right. 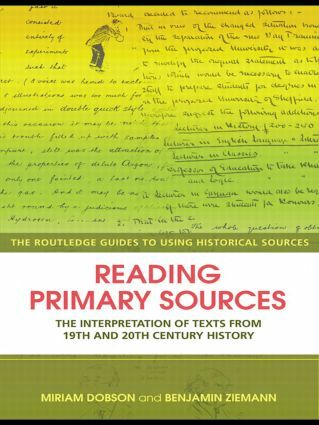 Taking examples of sources from around the globe, and also including a student-friendly further reading section, this is the perfect companion for every student of history who wants to engage with sources.